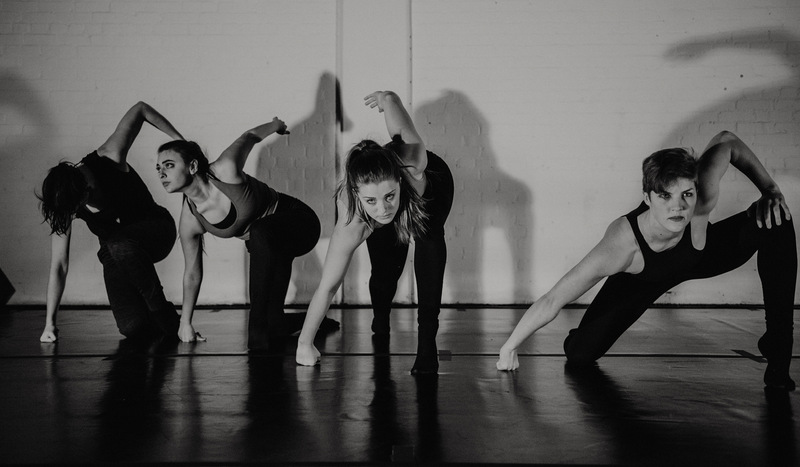 In its fifth year, RepCLT’s Ladyfest is the big event in Charlotte’s independent dance world. 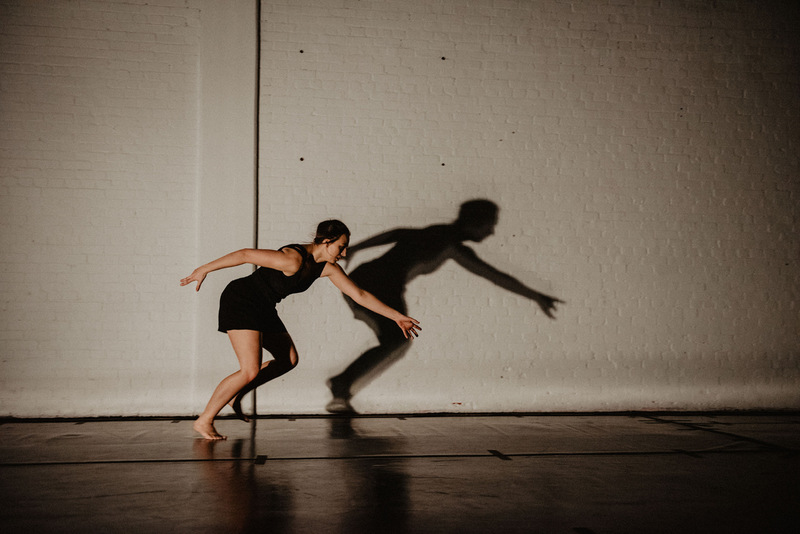 An evening length microfestival of contemporary dance and movement based performance created by women and curated by RepCLT’s directors, Sarah Ingel and Megan Payne, Ladyfest has grown into a safe bet if you’re looking for the best in cutting edge local dance. The quality of dance that Ingel and Payne managed to program this year was especially impressive. With the exception of one or two missteps, the work was uniformly excellent. Even the missteps were interesting, valuable experiments which will likely develop into more coherent and effective performances. A full evening of performance (clocking in at around three hours) that is composed almost entirely of home runs says something about the acuity of RepCLT’s collective curatorial eye and the wealth of talent in the region. Highlights of the evening included work by Audrey Dance, Emily Cargil, Reba Bowens and Caitlyn Swett, as well as Ingel and Payne. Baran Dance’s Bleach begins with floorwork performed by an undifferentiated mass of women’s bodies in white lace. What sounds like Balinese gamelan music plays softly as individuals begin to emerge, women picking their way gingerly through what might be a soggy field on a foggy day. This opening sequence is among the best work I’ve seen from Baran Dance. Polished and expressive choreography is sensitively articulated by the five performers, including choreographer Audrey Baran herself. Canon is applied to echoey effect as shapes or impulses radiate from dancer to dancer. Finally, as the work resolves, the lights dim and the dancers, in a starkly theatrical line-up center stage, slowly fade from vision performing one last enigmatic gesture. 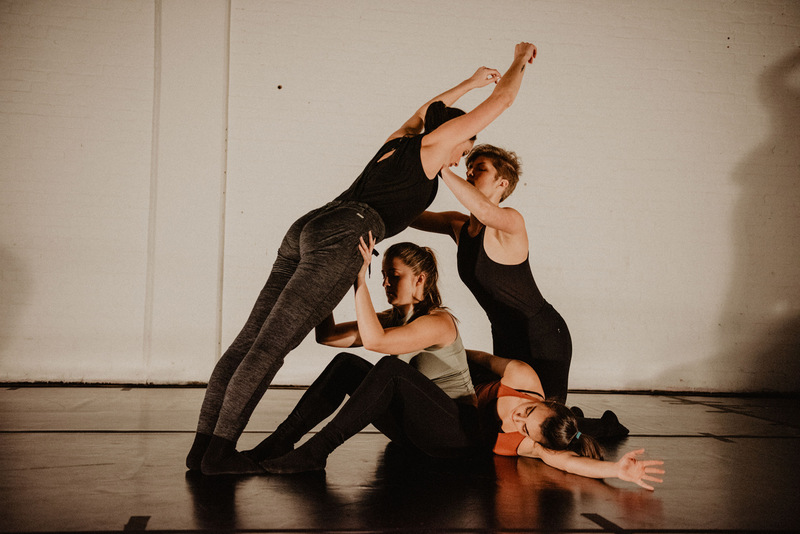 Sinister techno underscores the first section of Quiet Beings, choreographed by Cargil and performed by the quartet of Sydney Carr, Sarah Lanners, Kimberly Parks and Amanda Rentschler. (Rentschler also appears in Sarah Council’s A History of Dirt at the beginning of the evening and is a standout in both pieces: performing with expressivity and athleticism.) The beginning of Quiet Beings is achingly slow, and it works. Cargil and her performers trust the pace, which gives us permission to. As the piece continues it accumulates emotional weight. These four women are going through it somehow. It’s oppressive and effective. The tone shifts dramatically in the second section where classical guitar takes over sonically. This is a territory of primal intimacy and violence. The imagery of motherhood found here is deeply familiar, profound and iconic. This work was undoubtedly the throbbing highlight of the evening’s first half. After intermission we were treated to two pieces exploring the possibilities of filmed dance and the tension between recorded action and live event. In Bowens’ Support, a filmed trio dancing projected on the back wall of Goodyear’s main gallery contrasts with a duet performed live by Bowens and Adriana Blanco. In addition to the interesting questions raised by Bowens’ use of video, the movement and cadence of Support incorporates the principles and modes that she explores in her capoeira practice. Support is presented in an unpretentious, unadorned spirit. It felt more like a prayer or like an act of devotion than a performance. Similarly spiritual vibes suffuse RETA, a dance film by Swett and Jon Pfundstein. RETA finds beauty in the small things, mining Swett’s gorgeous movement and magnetic presence to refine a metaphysics of domesticity and the mundane. Setting — and testing — boundaries and investing everyday life with magic, RETA is a beautiful and slyly melancholic film which serves as a potent vehicle for Swett, who performs with toughness and tenderness in equal measure. Then Ingel tosses a hand grenade onto the stage and blows everything up. One Hundred Ways To Say No plunges us immediately into a maelstrom of sound and strobe light, i’s opening sequence an infernal call to arms. We’re on Ingel’s terms now, and quite possibly in another dimension. This isn’t narrative, it’s pure incantation. Ingel is burning herself at the stake and signaling to us through the flames. It’s a devastating way to start a performance. And then the lights pop on and the soundtrack shifts to Chris Isaak’s Wicked Game and we’ve been dropped down into the cool blind exuberance of some strange new obsession. After the assault of part one, part two, (complete with repetitions, breaking points and masochistic longing,) soothes us by simply relenting just a little bit. We are a little more comfortable with the terrain. It hurts but we recognize it. We start to trust ourselves, and our sensory apparatus, just a little. And so the third and final section of One Hundred Ways To Say No is either a betrayal or a benediction. This awkward, sad and gorgeous denouement is a literal rainbow of gauze falling slow from the heavens down on Ingel, who transforms this unwieldy mass of color and light into a slow motion cyclone. It’s a brash achievement by a brilliant creator. The evening ended with an equally bold statement from Ingel’s partner in RepCLT, Payne. There is something very deliberate about Payne’s work that is a delicious counterpoint to Ingel’s elemental power. With Moon and Ocean (Excerpt) Payne fully inhabits the voice that she has been developing over the past couple of years. Moon and Ocean seems to exist suspended in a strange and glamorous thrall. The performers (Hanna Blackwell, Paige Keller, Kylie Hester and Samantha Salvato) are exceptional, a cold and compelling hive mind rolling through kaleidoscopic sequences with insect intelligence. The work’s technical excellence and choreographic inventiveness is made all the more beautiful by the whiff of corruption that hangs over it. As the piece develops, an undercurrent of cruel complicity emerges, as the four performers are entangled in a game of status and desire. The internal logic of Moon and Ocean is uncompromising and magnetic, as seductive as it is unsettling. As the ultimate display of Charlotte’s female contemporary dancers, Ladyfest has reached a peak of art, dance and performance in the city. Here, at the pinnacle, the event is sure to linger etched in the minds of its audience. We can count ourselves lucky if Ladyfest continues to grow in excellence over the years to come.